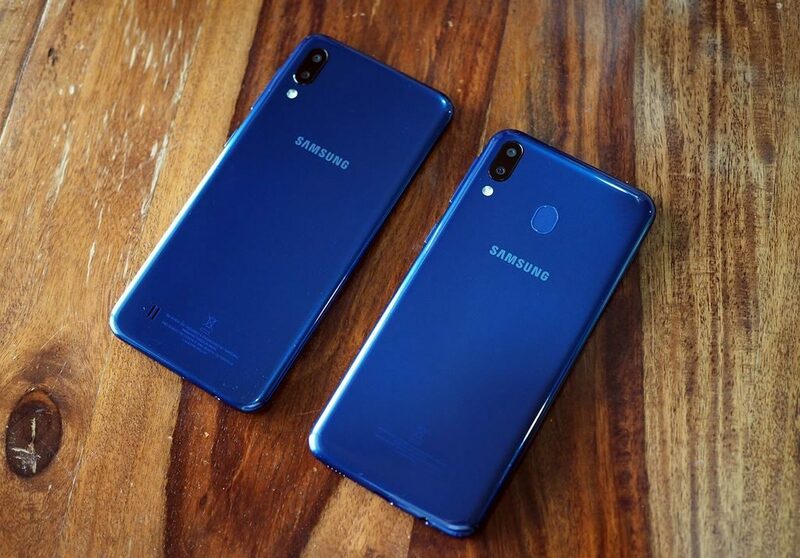 Samsung’s Galaxy M10 and M20 two cheap smartphones have just launched with “pretty” appearance and cheap price. Galaxy M10 and M20 are Samsung’s first smartphones equipped with Infinity-V screens, or water drop screens. Samsung’s Galaxy M smartphone line will begin to replace the previous Galaxy J line, which is cheap to compete with smartphones from Chinese brands. Galaxy M10 has 6.2 inch LCD screen, with HD + resolution and frame rate of 19.5: 9. Thanks to the Infinity-V design, the size and screen ratio increase. It can be seen that the top edge of this machine is very thin. The M20 has a slightly larger screen, at 6.3 inches but the resolution is raised to FullHD +, the lower edge of the M10 is also thicker than the M20. Samsung has equipped the M10 with an Exynos 7870 processor with 1.6GHz clock speed, 2GB or 3GB RAM, 32GB of storage and can expand up to 512GB with a microSD card. The hardware configuration of M20 is higher than M10, with the high-performance Exynos 7904 two-core processor 1.8GHz and 6 1.6Ghz power-saving cores, thus operating more efficiently. 3GB or 4GB RAM memory and 64GB storage capacity, can also expand up to 512GB via microSD memory card. Both machines have dual rear cameras, including a 5MP wide cam (120 degrees) and 13MP main lens. The rear camera on the M10 and M20 has Live Focus shooting mode. Camera selfie in M10 is 5MP and 8MP for M20 version. The front camera supports unlocking with the face, Selfie focus, supports flash with the screen. Galaxy M20 has fingerprint sensor and M10 does not. A highlight of Galaxy M20 is the equipped with large capacity battery, up to 5,000 mAh. This is the highest capacity ever appeared on Samsung A9 Pro smartphone. However, only Galaxy M20 is equipped with 15W quick charge and uses USB-C connection port. Galaxy M10 uses microUSB port, does not charge fast, 3,400 mAh battery. However, the use of Exynos 7870 chip will help M10 meet one day’s use. Galaxy M10 version of RAM 2GB / 16GB capacity priced at 112 USD. Galaxy M10 version 3GB RAM / 32GB capacity priced at 126 USD. Galaxy M20 RAM version 3GB / 32GB capacity priced at 155 USD. Galaxy M20 4GB RAM / 64GB version is priced at 182 USD.